Every winter ice provides a vital link to the mainland. Two hundred years ago British soldiers used teams of oxen to haul men and materials across the ice when they moved Fort Michilimackinac from the mainland to the island. In the later 1800s the weekly mail was brought by dogsleds and horse-drawn cutters were used to haul firewood from neighboring islands. Today, islanders anxiously wait for the Straits of Mackinac to freeze. Bitter cold and calm winds in January combine to form a solid sheet of ice. 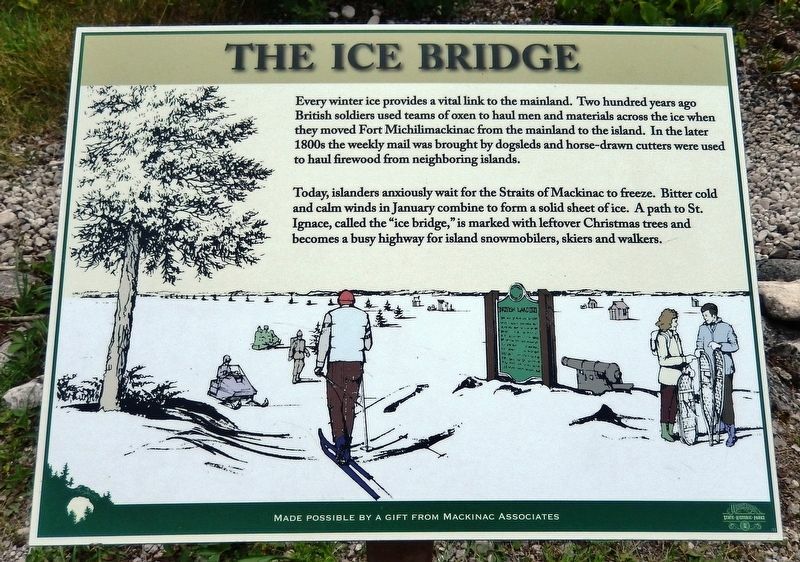 A path to St. Ignace, called the "ice bridge," is marked with leftover Christmas trees and becomes a busy highway for island snowmobilers, skiers and walkers. Erected by Mackinac Associates and Mackinac State Historic Parks. overlooking the Straits of Mackinac. 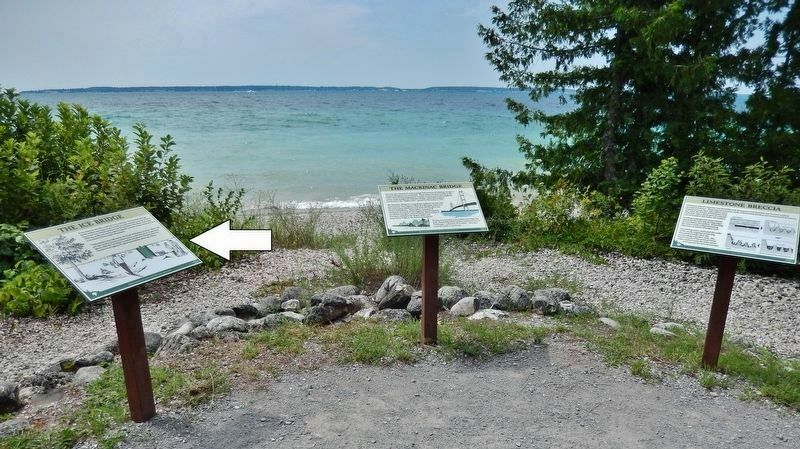 Marker is in this post office area: Mackinac Island MI 49757, United States of America. Touch for directions. Other nearby markers. At least 8 other markers are within 3 miles of this marker, measured as the crow flies. The Mackinac Bridge (here, next to this marker); British Landing (a few steps from this marker); Post Cemetery (approx. 1.8 miles away); Skull Cave (approx. 1.9 miles away); Fort Holmes (approx. 1.9 miles away); a different marker also named Fort Holmes (approx. 1.9 miles away); Grand Hotel (approx. 2.1 miles away); Mackinac Conference (approx. 2.1 miles away). Touch for a list and map of all markers in Mackinac Island. More. Search the internet for The Ice Bridge. Credits. This page was last revised on April 5, 2019. This page originally submitted on April 5, 2019, by Cosmos Mariner of Cape Canaveral, Florida. This page has been viewed 100 times since then. Photos: 1, 2. submitted on April 5, 2019, by Cosmos Mariner of Cape Canaveral, Florida.